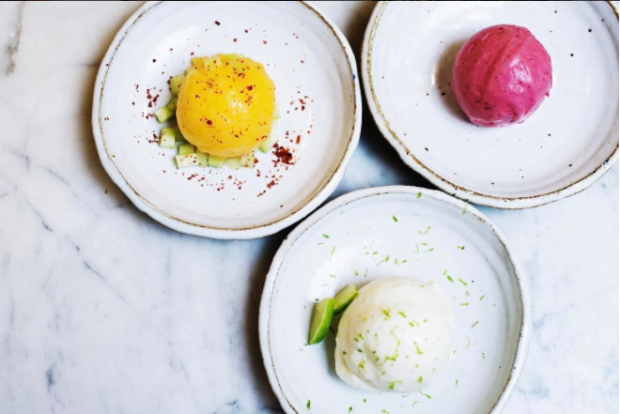 When you arrive at Manuela, the Arts District’s latest culinary hotspot, you may be told there’s an hour wait for a party of two. All the better. 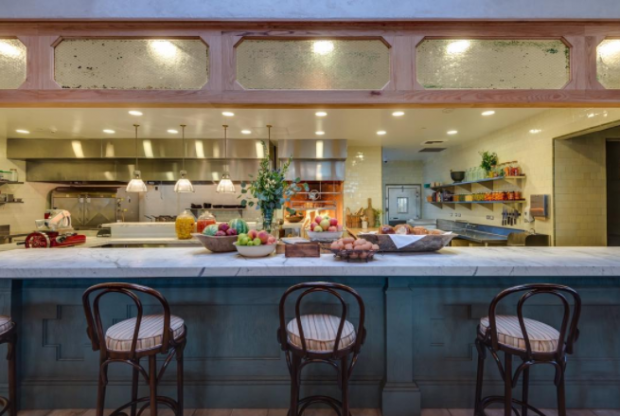 Manuela might be the only restaurant in Los Angeles where the wait is not only enjoyable it’s necessary. Manuela is located in the Hauser Wirth & Schimmel art gallery, a restored antique warehouse, in the core of the burgeoning Arts District. 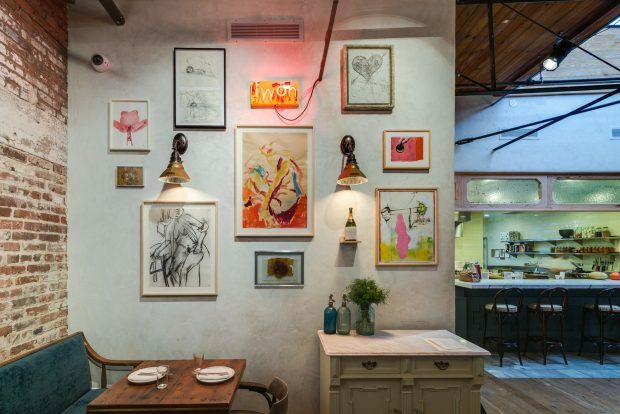 It’s an indoor/outdoor establishment with Manuela stretching out into the courtyard, surrounded by a brilliantly curated art book store, several gallery spaces, communal dining spaces, and a vegetable garden and chicken coop. It all feels extraordinarily of the moment LA until you try Manuela’s food and you’re transported to the South. Maybe a bit of Texas here? Mexico there? 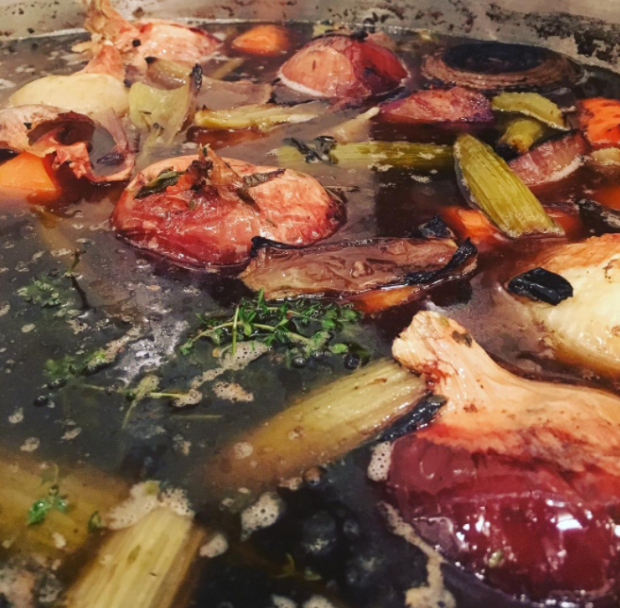 Whatever the dining influences and inspirations of chef Wes Whitsell and the Manuela team, one thing is clear: they’re offering delicious comfort food, at a price. But cooked into Manuela’s menu is the experience. Guests are paying for more than just food. Included is a day or evening of appetizing art, incredible craft cocktails, and a communal experience more nutritive than just simple people watching. 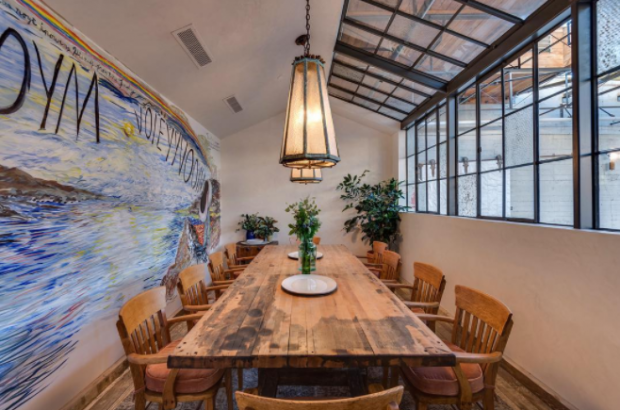 LA is spending hours at Manuela and Hauser Wirth & Schimmel, and not just at the dining table. 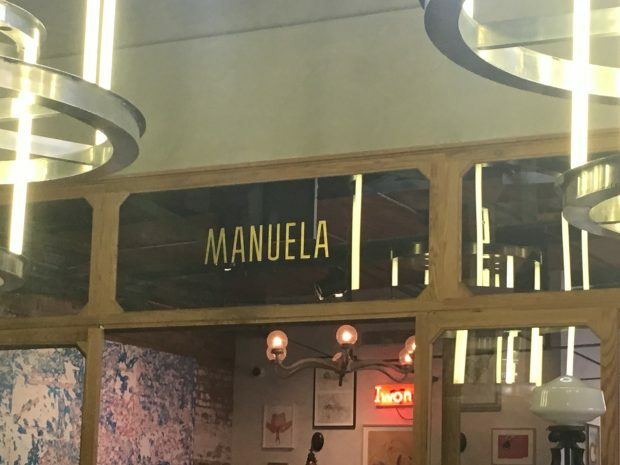 Manuela opened in October of 2016 in the sprawling mixed-use gallery complex. As I said, you may have to wait for a table. So head on over to one of the gallery spaces or to the bookstore or chicken coop or admire the giant metal rose sculpture by artist Isa Genzken in the court yard. Or, of course, head to the bar. If you’re having brunch, definitely get a Bloody Mary or two. 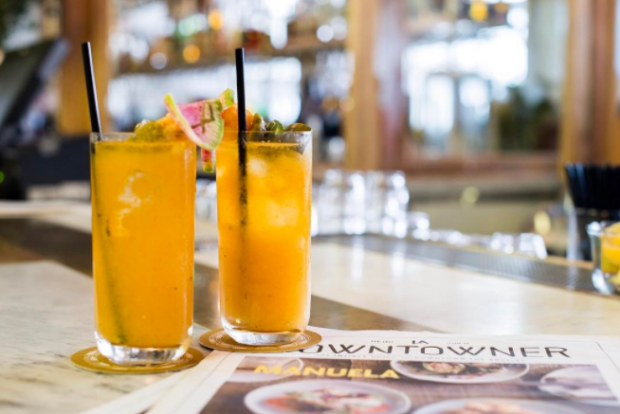 At Manuela, they are made with yellow tomatoes which makes for a tangier, less sweet (and often stiff) refresher. 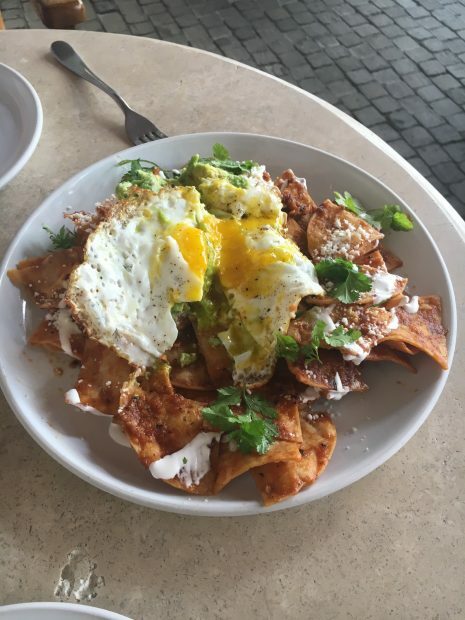 Once you’re seated for brunch you may look around you and see a plate of Chilaquiles at every table. So, of course, you’ll have to try it yourself. Be sure to get the extra egg on top if you’re sharing. I found the dish straight forward, yet with refined and complex Tex-Mex flavors. Next up you’ll have to try The Redneck, the now famous hors d’oeuvre thanks to Jonathan Gold. 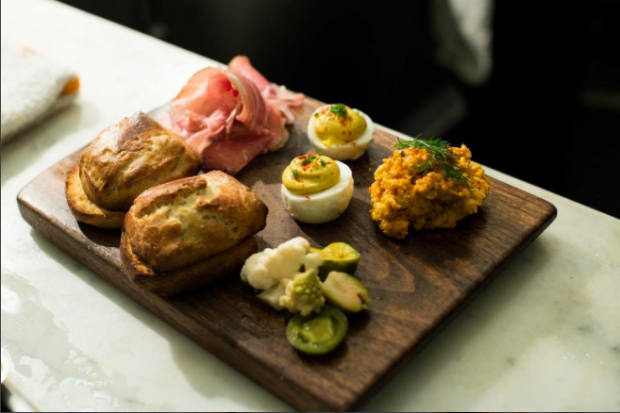 It consists of country ham, pickles, pimento cheese, eggs aioli, and fresh house-made biscuits. It’s all so good you might be tempted to order all the other starters from Maneula’s “Raw, Cured, & Pickled section. 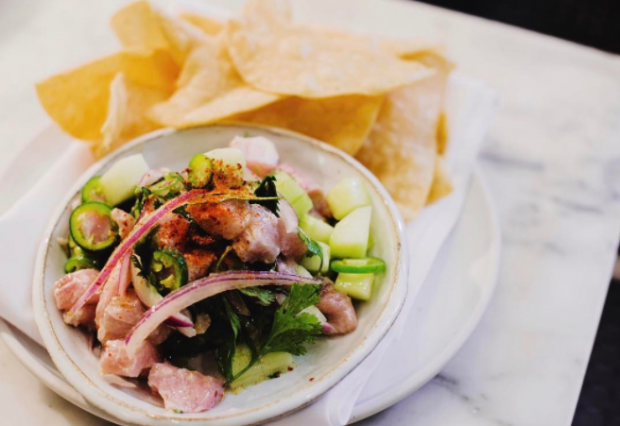 The Ahi tuna ceviche served with potato chips was a nice spin on a new classic. 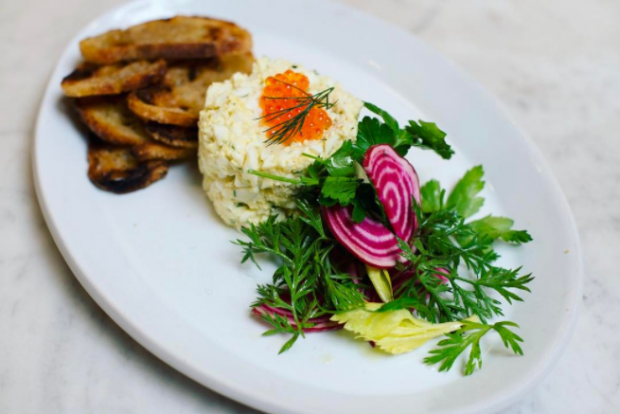 I also quite enjoyed the Garden Egg Salad, with trout roe, celery leaf, and sourdough toast. The sourdough at Manuela rivals only their biscuits! 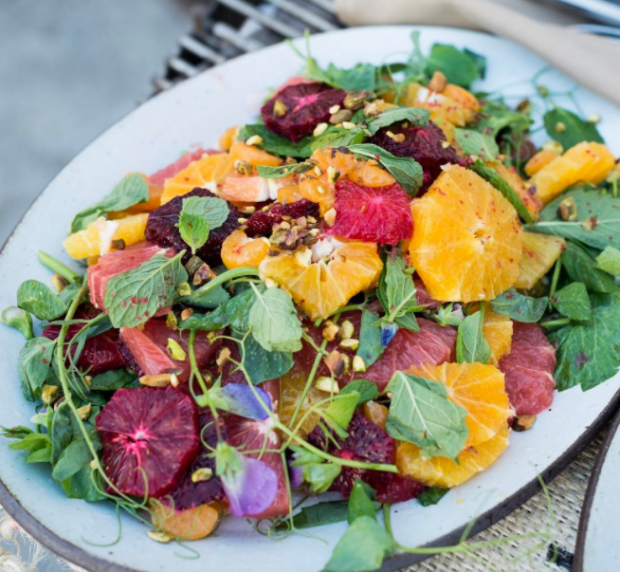 The citrus salad is the perfect (and healthy!) palate cleanser before the transition to the delectable heavier foods to come. I’ve since had all their salads, including the Butter Lettuce, made with shallot cider vinaigrette. 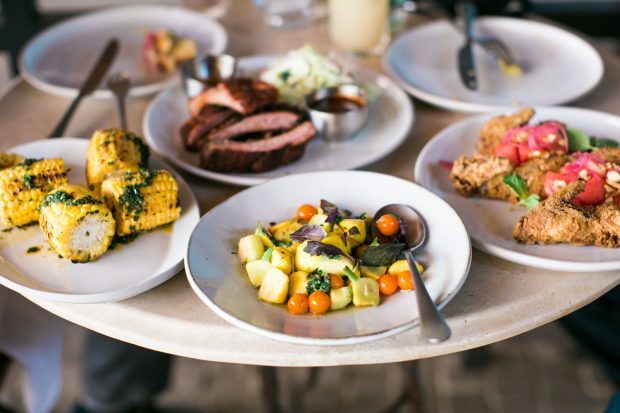 The Spicy Greens with shaved pear and Manuela cider vinegar, the Dungeness Crab Salad with endive and avocado, and, my personal favorite, the Citrus Cured Salmon Salad with fennel, beets, and dill. Time for more drinks? Yes, please. The Rattlesnake Round Up is made with Redemption rye whiskey, house made pimms, dates, and lemon. 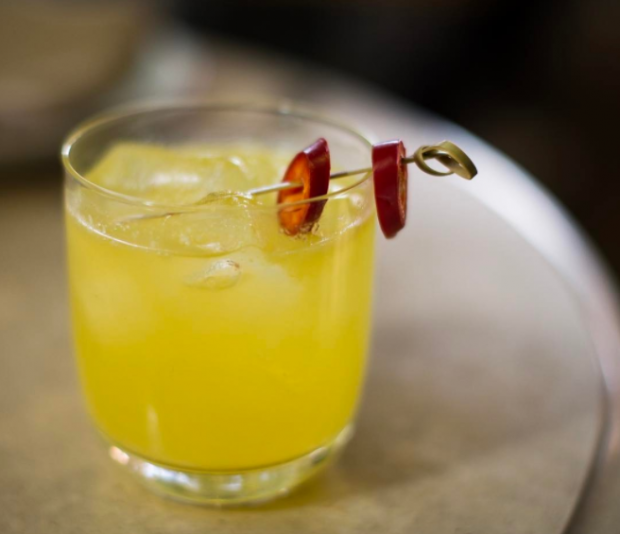 The Verbena Mule with Angostura rum, l’orgeat, verbena, ginger, and lime. But, as you may know, I am partial to wine and I quite liked their wine list, which included Domaine des Billards from France, a Lorenza rosé from California, and a Cristom pinot gris from Oregon. 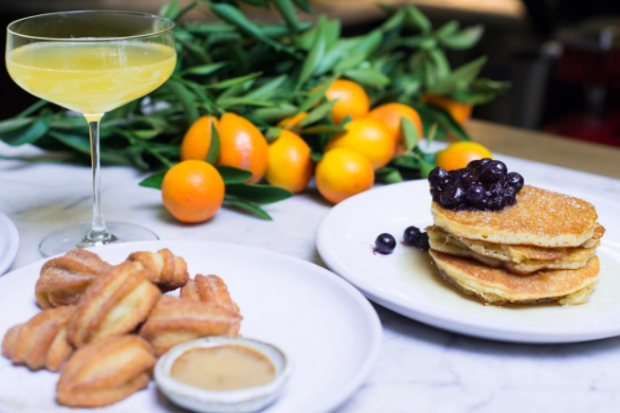 And since it may be Saturday or Sunday brunch, you may want to splurge and have some delicious cornmeal pancakes. Or a few scoops of ice cream. On your way out don’t forget to take a peek into Manuela’s private dining room to see a mural painted by artist Raymond Pettibon. 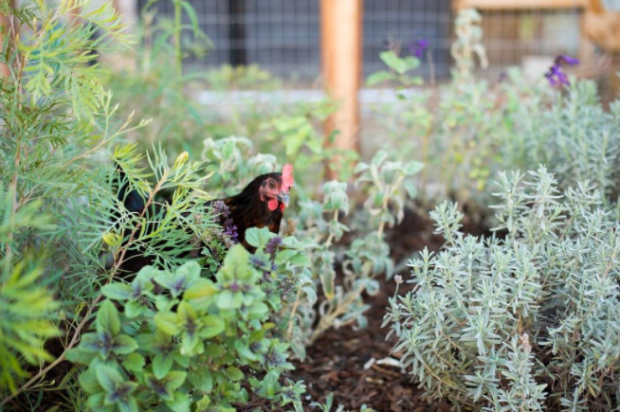 And be sure to go out to the chicken coop and garden to say hello to Minerva, Manuela’s star chicken. With rotating art shows, we can’t wait to go back to Manuela for another busy and entertaining day full of art, food, friends, and wine. Follow Manuela on Instagram @MANUELADTLA.